Dr. Pudusseri is proud to provide cardiology services for patients in the Finger Lakes area of upstate New York through Finger Lakes Cardiology Associates. Dr. Pudusseri's medical practice includes office and hospital cardiology. Her specialization is in clinical cardiology, echocardiography, peripheral vascular screening and nuclear cardiology. She sees patients in the Finger Lakes Cardiology office in Clifton Springs and cares for hospitalized patients at Clifton Springs Hospital and Clinic and F.F. Thompson Hospital in Canandaigua. She is certified by the American Board of Internal Medicine in both Internal Medicine and Cardiovascular Disease. 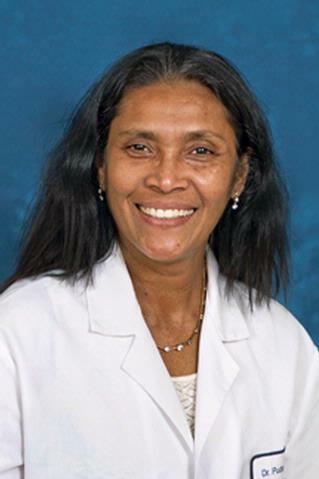 Dr. Pudusseri received her medical degree from Kerala University, Kottayam Medical College in India. She moved to New York and completed her residency in Internal Medicine and her fellowship in Cardiology at New York Medical College, Metropolitan Hospital. She joined the faculty in 2003.